It was a tussle between Yeppoon’s two favourite golfing sons but in the end, it was the more experienced Adam Blyth who held tough through three extra playoff holes to defeat Jake McLeod at the South Pacific Open Championship. Starting a shot ahead of McLeod at Noumea’s Tina Golf Course, Blyth battled with the difficult setup and windy conditions on the final day to shoot an even-par 71 for a 12-under 272 total. He and McLeod exchanged possession of the lead a number of times over the final round but in the end, a playoff was required after McLeod signed for a one-under 70 to tie the lead. On the third trip down the par-five 18th hole, the 22-year old came to grief and recorded a triple bogey to hand the title to Blyth. The win was a shot in the arm for the 34-year-old who has recently re-dedicated himself to his game after a tough patch in a career that has already seen him a winner on the Web.com Tour. For McLeod, who owns a haircut American Charley Hoffman (circa 2012) would be proud of, his second place finish was the best result of his young career to date, lifting him to 28th place on the Order of Merit. The ever-reliable Matthew Millar finished just a shot out of the playoff in third place at 11-under, moving into third place on the Order of Merit list. Millar finished two shots clear of Queensland’s Michael Wright in fourth place while New Zealand’s Nick Gillespie finished along in fifth place at 8-under. 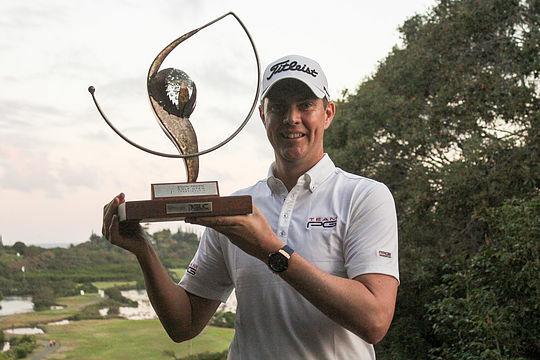 The PGA Tour of Australasia resumes in a fortnight for the $1.5 million Fiji International from October 6-9, which is shaping up as another wonderful event in the South Pacific. American Matt Kuchar will not be returning to defend but the list of international visitors is still impressive, headed by fellow American Ryder Cupper and former FedEx Cup champion Brandt Snedeker, Boo Weekley, Heath Slocum and Jeev Milka Singh. Fijian hero and three-time major champion Vijay Singh will return to Natadola Bay as will fellow PGA TOUR regulars Steven Bowditch, Robert Allenby and Jarrod Lyle.